The appeals ruling actually protects the couple. Previously, the state reserved the right to revoke a permit at any time, which meant that if your planner was out of compliance, the state could stop the ceremony and the couple would be out of luck. Now, the permits are irrevocable. This means that once your planner has pulled the permit, the state cannot stop the ceremony for any reason. If your planner is out of compliance, sanctions would take place, against the planner, AFTER the ceremony has taken place and the event has concluded. The rules promulgated by the state barred us from using certain props during a beach wedding. We cannot bring chairs to the beach but we can provide chairs for people who need them such as the elderly or disabled. Arches are not allowed but we can do loose flowers such as a petal aisle or a circle of flowers, and music cannot be amplified but we are allowed to have our wonderful live musicians available to play instruments and sing. Hula dancing is OK as is a cake table, video and photography equipment and dove releases. You may listen to the 4 minute interview here. 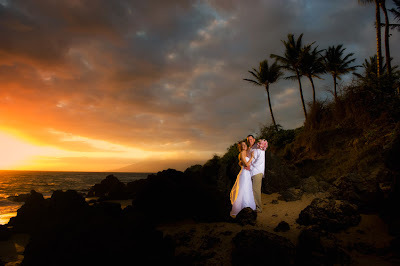 Anyone considering a beach wedding on Maui should now feel confident that the new rules are neither onerous nor pose a threat to the successful completion of your special day. We stand ready to provide the professional, courteous service you expect and we are knowledgeable of and in full compliance with the laws of the state of Hawaii.